I watched Victorian Slum House, episode 2 last night. It was good, again, and pointed out many of our modern perspectives. There seemed to be a focus on single women and children in this episode. We're so accustomed to single mothers capably providing for their children that it is hard to imagine a time when even if a single mother wanted to find work outside the home there simply weren't many opportunities. I did think that the single mother didn't plan for herself and children as well as perhaps she could have. But maybe that is hindsight. As we discussed the other day, she could have shared housing. I don't know if she completely understood the different attitudes toward public assistance of modern times compared to Victorian times. It is easier to feel like someone will "rescue" us should we make a poor choice, today, than would have been present then. I also feel like children today don't always understand hard work as well as they would have in Victorian times. I'm not criticizing this mother or her children, but it did seem like they brought modern values into their roles. All that aside, aren't we all so fortunate to have comfortable beds to sleep in, a hot cup of tea or coffee each day to wake up with, a decent meal to fill our stomachs, even if it's just a PBJ, and a hot shower to clean off each day? I found myself stressed over the characters' financial situations. I really wanted the single mother to succeed. I wanted the older gentleman to find work. I wanted the Irish immigrant guy to have a bed to sleep in. I also realized that my feelings were in part due to living in a place and time where I do. In Victorian times, the struggle to survive was so intense in the slums that everyone had to focus on themselves and their own situation. What I realized watching this episode was that I would not be able to pluck feathers off of a chicken, not and keep my lunch down. Oh my goodness. I felt so sorry for that young woman. But she did what she needed to do, and I admire that in a person. I don't know if I'll be blending milk into butter to stretch it. Perhaps. It occurred to me, though, that with modern mixers this job would be a quick one, perhaps doing this in a bowl with mixer just prior to baking something from scratch, like a cake, which could use any butter on the beaters/bowl in the batter, after scooping out the blended butter to a container. Maybe I will give this a try. The other residual effect from watching this show was feeling guilty for wasting time. I tried a couple of times during the day to watch the show, but kept feeling like I should "make hay while the sun shines" and get the garden planted and the baking done for the day. As a result, I did get all of the garden, proper, planted, except for cucumbers (they have to wait for slightly warmer soil), and the deck pots. I even planted the carrot seeds that I saved from a carrot plant last summer, and the parsley seeds that I harvested the year prior. I need to select one plant to save seeds from this season, maybe lettuce. And I didn't watch the show until the late evening. One other funny observation -- the women's hair. I no longer feel bad that my hair sometimes looks less than tidy, when I've been working around the house. I have many days where I jump into work before tending to those pesky tasks like brushing my hair. 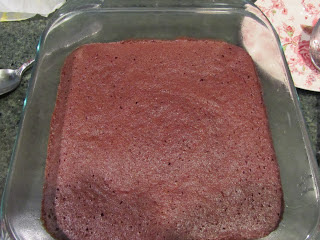 In the baking, I made my favorite scratch brownies. This is a wonderful recipe that can be microwaved or baked in a conventional oven. I was using the oven for hot dog buns, so I chose a conventional oven yesterday. The recipe calls for 1/2 cup of butter. I decided to try using just 2 tablespoons of butter and a scant 3/8 cup of oil, in place of the called-for amount of butter. They turned out well. No complaints at all. In other butter news, yesterday's post was before I discovered this -- our local Cash & Carry has butter on sale through the 14th for $2.38/lb. For some of you that may sound like a fantastic price. It's a lot more than what I paid for butter when I really stocked up there, 18 months ago, so it's hard to swallow. I'm debating over how much to buy. It won't be a huge stock-up, as that price will be repeated or beat, most likely before the fall baking sales. Some butter will be better than no butter. What stood out to you about episode 2, if you've watched it, or episode 1 if you're catching up? Did you feel you gained anything from watching, as I did with wanting to make the most of my daytime to work outdoors before the sun set, or rain came back? How did you feel about the attitude towards what is women's work vs. "the more important" men's work? The show raised an important issue that effects today's world, too, that of devaluing the older worker. I think society shortchanges itself when we fail to recognize the value of experience and wisdom in our elder work force. (Okay, stepping off my soapbox now.) Anyways, what were your thoughts? They did show one woman drinking tea when first getting up. They may not have had any tools to work with for chopping vegs for soup. But, yes, it does seem like they could bake a potato, at the least. Even those who didn't have a stove would have been able to cook over the fire in the courtyard. I supposed, though, that they are still acclimating to the show and their limitations. I do wonder what the price of a single potato, carrot or other root veg would have been compared to a slice of bread. I wanted to watch this but forgot. Can you watch them anytime or do you have to follow the schedule? You have until May 30, to watch the first episode and until June 6 to watch the 2nd, if you can access the pbs.org website. I hope you get a chance to see it to decide if it's a show you'd like to follow. I wondered the same thing, especially with the single mother and her children. I wonder if their lack of success was scripted. Yes, I know, it did seem like the tailor's family was industrious, as well as the young immigrants. It also seemed to me that the tailor's family was given "more respectable" work, in piecing the clothing, compared to making the flowers. The older gentleman commented that he didn't feel he should be sitting around doing "women's work." I do think the brother/sister pair will be successful, too. They recognized right off the bat that they would need to work hard. The brother didn't take a bed, in order to spare money for the next day. They are planning ahead, at least. Isn't that exactly what we do, too? We plan for unforeseen circumstances, by saving. I can totally understand how families would see their children as part of the labor force. It seems that to have financial success you would need your children to work alongside you, for at least part of the day. Just like living on a farm, children would have been expected to do meaningful and productive chores before and after school each day. I think that we're both enjoying the show! Have a great day, Cheryl! I feel that there was some laziness on the part of the single mom and kids--today, kids sleep in but back then it would never have been allowed if it were a matter of food or no food. Mom wasn't too aggressive either. And what was the end of the show all about with everyone sitting together and eating mashed potatoes and gravy? Did that happen every night for the show or did the 1870s always eat a common meal each night. I guess I don't always know what is the show and what was the reality of the time. The jobs people were looking for seemed to be today's jobs but 1870s wages. Not sure. I wondered if the mashed potatoes and gravy were provided or if this was a meal they paid for. It does seem like it would be unethical to allow families (especially children) to starve for the sake of the show. I thought that about the children, too. In the 1870s, I would imagine the mother would rouse the children early, and get them started on productive chores for the day. At the very least, a mother would set up some schooling for part of the day, and had the kids prepare a simple meal, make beds, fetch things, or bring in drinking water for everyone, while the adults continued with work to provide for them all. I also noticed that the single mother left the others to continue making the flowers, when she took her children to their room for bedtime. I would have expected her to take a bunch of flower-making supplies with her, to continue in the work in her own room, after her children feel asleep. The show does emphasize how important it would have been to be industrious all of the time, with little time for breaks. Very bleak. This show must appeal to frugalistas! :) We watched it last night, as well. I agree with you on the single mom--I felt like she is used to having a safety net (friends, government assistance, etc.) and was participating in the show based on modern assumptions (i.e. somebody, somewhere will help her out). I think we were also seeing our current culture reflected in many (not all) of the children's participation--I'm pretty sure if working meant eating, kids wouldn't have been "too tired or bored" to help support the family. I had the same thoughts as you about making a soup or baking a potato on the stove (or in the outdoor ashes of the fire). On a different note--I have subbed in 1/2 applesauce and 1/2 butter in your brownie recipe--I DO like the full butter, obviously, but it was still a good result (and lighter on the waistline ...). Yes, I think this show was designed to appeal to people like us! I have family members who would not at all "get it." With the kids, I can practically hear myself saying to my own kids, "oh you're bored, are you. I guess eating is boring, too." I thought it was interesting that the tailor's son understood and had used sewing machines, and knew all about the treadle machines. Thanks for letting me know about the brownies. I'm going to price applesauce when I buy butter. I thought I could portion out the applesauce into amounts for baking and freeze. I'll let you know how that goes. Funny! I would have a similar reaction with my kids--"You like eating, don't you?". And like you mentioned above, sleeping in wouldn't have been an option--I would have encouraged my kids to find a way to help out the family. I think I would have noticed that the tailor's family seemed to fare the best, financially (they also seem to work well together), and would have tried to be apprenticed to that trade in hopes of making a more stable income. Also, I liked how the new young man (Irish) was planning on saving back a bit of money for a "just in case" scenario. Exactly how my mind works! Oh thanks! And it rained overnight, so a very good thing I got the seeds all in before the rain. Interesting about brownie recipes and oil. I may try all oil the next time. I do like the flavor of butter, though. But maybe that doesn't matter so much in something chocolatey. I hope your day is off to a great start, Sara! Hooray for rain on the seeds! I don't now if you like gooey brownies or cakey ones. I think that the all-oil recipes are for gooey ones, and that makes sense. I think butter is better in almost everything (I love butter), but if you could make brownies you liked with oil, seems like it would be a more economical treat. My mom used to only use butter in things like shortbread where there was no way to get a decent flavor without it, but often used margarine, shortening, and/or oil in things with a lot of other flavors, just to save money. Oh that's good to know, Sara, about gooey-er brownies made with oil. That's the kind that I like. My mom used half butter/half margarine in baking. She thought you could get the butter flavor with just half the amount, and subbing margarine for the other half. I prefer oil over margarine for health reasons. So I will try more of that. I didn't realize this show had people trying to live in an earlier time. How exciting! It will keep me motivated on the treadmill. Would the show be appropriate for a 6th grader? I can't think of anything that would not be appropriate for your daughter's age level in the show. It would be a good opening for many discussions, I'd think. Enjoy the show!